Summary: The features of the morphological changes in the spleen in terms of the chronic neoplastic endotoxemia, caused by induced colorectal cancer, were investigated. Key words: chronic neoplastic endotoxemia, cancer, spleen, pathomorphology, early indirect tumor markers. According to the data of WHO, each year about 10 million patients worldwide are diagnosed with "cancer", while oncological formations of the gastrointestinal tract take third place in this ranking. Usually the early stages of malignant tumors are asymptomatic. Now there is a way to diagnose cancer at an early stage-tumor markers for intestinal cancer . However, none of them is 100 % specific. Almost every healthy person can detect a slight increase in these indexes. A significant increase in the concentration of tumor markers is observed in the later stages of the disease, when malignant oncological formation is sufficiently developed Therefore, the search continues for indirect markers for the diagnosis of development of cancer process of the colon . Changes in the spleen, which is an important organ of immunogenesis, can serve as one of these indirect markers. The purpose of scientific research was to study severity of morphological changes in the structural elements of spleen in terms of induced cancerogenesis. Research was conducted on 20 mature outbred white male rats with body weight (190±5) g, kept in standard vivarium conditions. Experimental animals were divided in 2 groups: control (10 animals) and a group of animals with modeled cancerogenesis. Cancerogenesis was induced by subcutaneous interscapular injection of 1,2-dimethylhydrazine dihydrochloride (DMH) once a week during 30 weeks . The degree of intoxication was rated by erythrocyte index of intoxication (EII) and by amount of middle-mass molecules (МMМ238, МMМ254, МMМ260 and МMМ280). Since erythrocyte membranes may be considered as a prototype of plasmatic membranes of the whole body, increased permeability of erythrocyte membranes (elevation of EII) can be recognized as a general manifestation for all body cell membranes . The most promising substrates for detailed study of endogenous intoxication are MMM, which are oligopeptides with molecular mass of 500-5000 Da and refer to protein toxins with high content of dicarboxylic acids and low content of aromatic acids. MMM have a direct toxic influence on cell membranes and initiate the emersion of proteins, structurally close to bioregulators. МMM are highly bioactive. Significant increase of MMM blood rate on the background of diverse pathology is prognostically unfavorable indicator of disease course . to 34,1 %, 9,8 %, 17,4 %, 21,2 % respectively. The highest rate of МMМ238 was observed in 6 and 7 months after beginning of injection and raised up to 41,7 % and 43,2 % respectively. Credibly, in this period significant progression of endotoxicosis by avalanche accumulation of MMM in the blood. Increase of МММ254 rate was similar to the МММ238: evaluation from the 1 month of DMH-injection (to 15,0 %) with further growth in 2 (to 33,6 %), 3 (to 16,4 %), 4 (to 21,1 %), 5 (to 25,8 %) months of experiment with abrupt increase in 6 (to 50,8 %) and 7 (to 50,9 %) months of modelled oncoprocess. МММ260 rate was increased during the whole time of experiment with highest evaluation in 2, 6 and 7 months after beginning of the inducted affection: to 22,5 %, 39,4 %, 40,1 % respectively. Statistically significant increase of the МMМ280 rate showed up in the 2 month of the DMH-injection − to 27,1 % in comparison with the control indicator. Noticeable evaluation took place in 6 and 7 months of experiment – to 34,1 % and 35,4 % respectively. Histology showed, that already after 8 weeks of experiment in the spleen of experimental animals morphological changes of vascular meshwork can be found. Those are dilatation and plethora of trabecular vessels with erythrocyte aggregation. Several vessels contain isolated microtrombs. Fig. 1 - Histological changes in the spleen of the animal after 2 months of experiment. Thickened trabeculae (1), dilatation and plethora of trabecular vessels (2). Stained with hematoxylin and eosin. x 80. In 7 month of DMH-affection deep destructive-degenerative changes of all elements of the organ were identified. Severe swelling and excrescence of conjunctive tissue in support-contractile apparatus of the spleen manifest by trabecular thickening. The white pulp goes under degeneration and destruction of the lymphoid tissue, shown by decreasing its size. The germinal centres of several lymphatic nodules disappear, peripheral to the nodules disorganization of the periarterial lymphoid zones takes place. In conclusion, conducted histology of the spleen of experimental animals in terms of modeling of chronic neoplastic intoxication, induced by injection of DMH, showed the development of destructive-degenerative changes in the vessels, stroma, red and white pulp. Severity of pathomorphological changes in spleen raises proportionally to the increasing duration of oncogenic factor impact. Bendardaf R. Prognostic and predictive molecular markers in colorectal carcinoma / R. Bendardaf, H. Lamlum, S. Pyrhonen // Anticancer Res. – 2004. 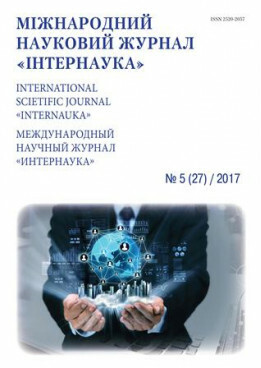 – № 4, Vol. 24. – P. 2519–2530. Кравчук С. Ю. Інволютивна теорія канцерогенезу / С. Ю. Кравчук // Буковинський медичний вісник. – 2008. – Т. 12, № 2. – С. 134–138. Экспериментальное изучение действия Lentinus Edodes (Шиитаке) на рост опухоли у мышей на моделях трансплантационного и химического канцерогенеза / В. П. Дерягина, Н. И. Рыжова, А. Н. Разин // Российский онкологический журнал. – 2009. – № 1. – С. 33–38. Способ диагностики эндогенной интоксикации / А. А. Тогайбаев, А. В. Кургузкин, И. В. Рикун, Р. М. Карибжанова // Лабораторное дело. – 1988. – № 9. – С. 22–24. Громашевська Л. Л. «Середні молекули» як один з показників «метаболічної інтоксикації» в організмі / Л. Л. Громашевська // Лабораторна діагностика. – 1997. – № 1. – С. 11–15.